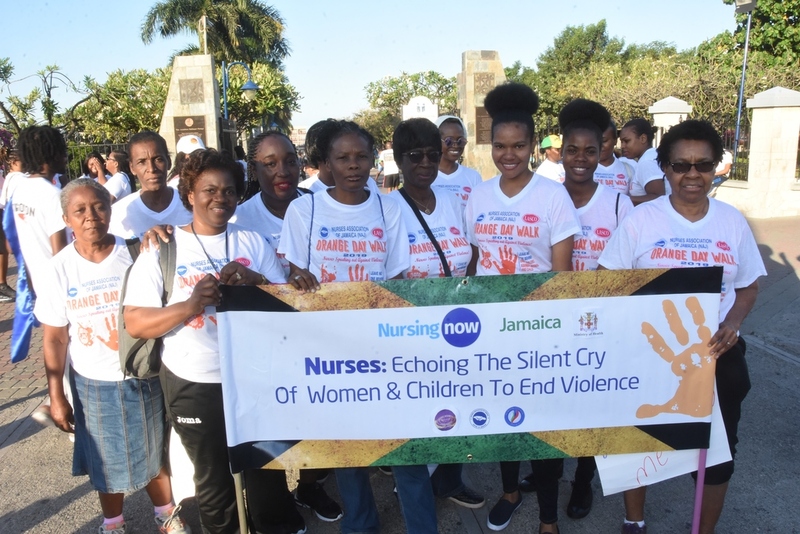 Nurses of Nursing Now Jamaica lend their voices to the LASCO/Nurses Association of Jamaica (NAJ) Orange Day Walk to end violence against women and children in Jamaica on Saturday March 23, 2019. Inspired to bring about a reduction in the incidence of violence against women and children, 2018 LASCO/Nurses Association of Jamaica (NAJ) Nurse of the Year, Denese Dacres Reeves recently rallied dozens of people to participate in the Orange Day March. The march, held in Kingston, served as a second serving of activism following the Orange Day walk held in Mandeville, Manchester in January. 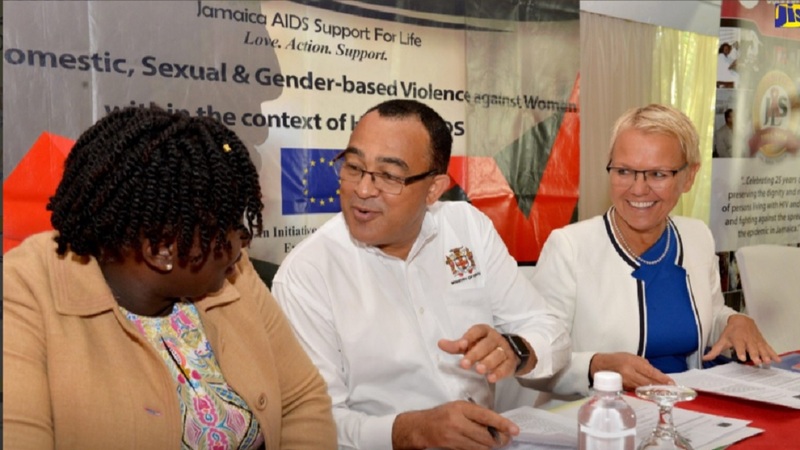 According to Dacres Reeves, the impact of violence on women and children has been understated in recent years, therefore the Orange Day walk should help bring about much-needed attention to the problem. “This [Orange Day] March came about as a result of the findings of appalling statistics on violence against women and girls. But to our boys. 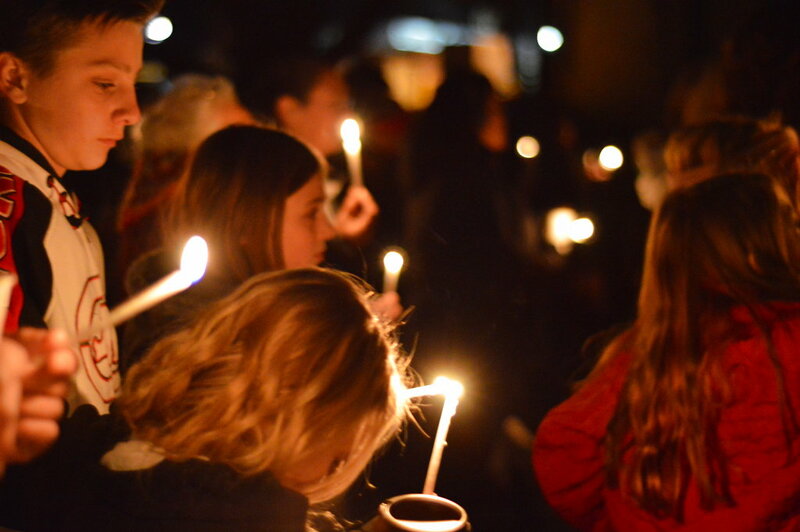 It was found that our boys are not immune to violent acts,” she said. Dacres Reeves believes that the ways in which some children are being raised have helped to perpetuate violence in society. 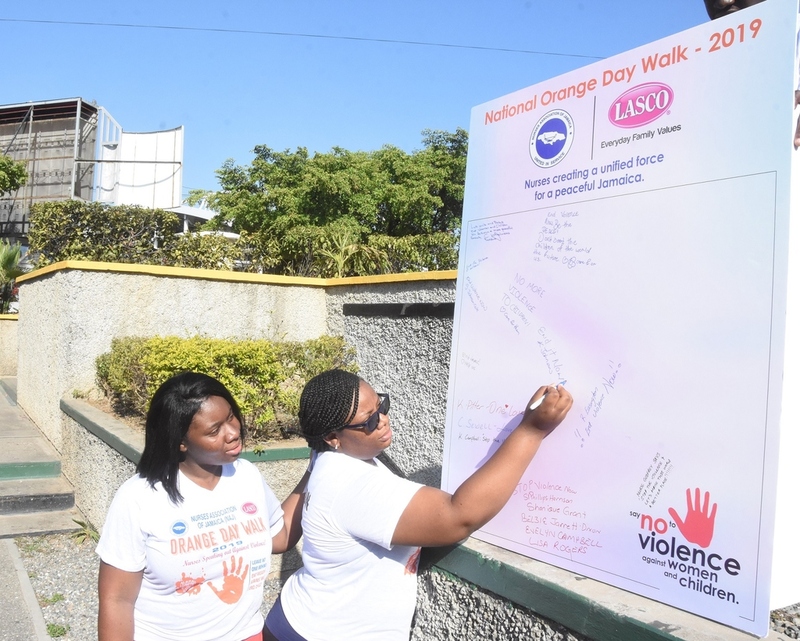 Nurse Krishna Grant Johnson (right) of Spanish Town Hospital leaves a powerful message inspired by the LASCO/Nurses Association of Jamaica Orange Day Walk for the end of violence against women and children in Jamaica on Saturday March 23, 2019. Looking on is colleague and friend Nurse Swaimoi Johnson Cole of Spanish Town Hospital. Guest Speaker at the Orange Day March, Senior Medical Officer at the May Pen Hospital Bradley Edwards, echoed Dacres Reeves’ sentiments. He reasoned that through stemming violence against women and children, the nation would see a reduction in the rate of crime. 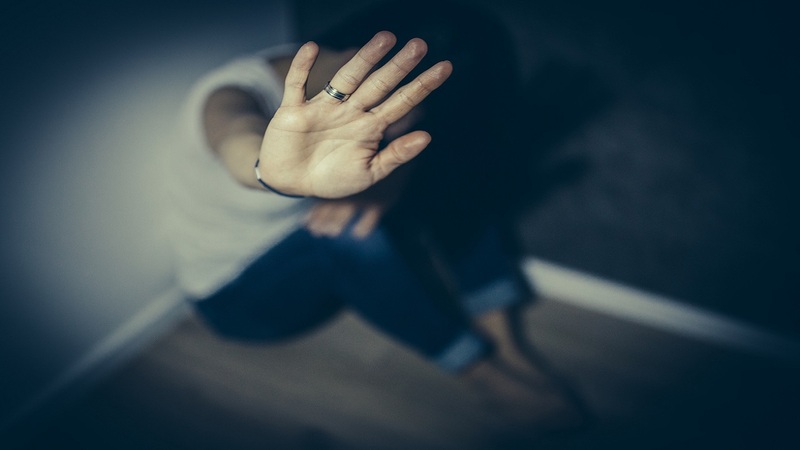 Citing statistics from the World Health Organisation (WHO), Edwards said homicide was among the top five causes of death of adolescents. He also shared that one in four children suffer physical abuse and one in five girls is sexually abused at least once in her lifetime. “This is not normal,” he charged. He, therefore, urged nurses and other stakeholders committed to preventing and responding to violence against children and adolescents – to apply the WHO INSPIRE Technical package. Trekkers Adventures Jamaica showed up in support of the LASCO/Nurses Association of Jamaica Orange Day Walk for the end of violence against women and children in Jamaica on Saturday March 23, 2019. The INSPIRE Technical package applies a group of strategies with the greatest potential to the greatest potential to reduce violence against children. Strategies of the package include Implementation and enforcement of laws; Norms and values, Safe environments; Parent and caregiver support; Income and economic strengthening; Response and support services and Education and life skills. Edwards outlined how INSPIRE strategies could be applied in the Jamaican context. With regards to the strategies of enforcing norms and values, Edwards urged Jamaicans to look to the word of God. “Our guide at this point in time is the Bible. We are being pushed away from the Bible with certain things that we are asked to consider. But we need to know where our norms and values come from and just stand on the word of God,” Edwards said. Edwards also called for a shift in Jamaica’s education system, he said students need to be encouraged to find solutions to issues. “Our education system over the years has been predicated on skills set that are not relevant to the country. We need to encourage our children’s to think about solutions. Not just how to be a doctor or a nurse,” he said. Renee Rose, Brand Manager at LASCO, the main sponsor of the initiatives been undertaken by the nurse of the year, encouraged Jamaicans to hold each other accountable in the effort to end violence against women and children. “As we continue to promote everyday values, we ask you to keep in mind, the role the family plays in the positive reinforcement of values of our children. Remember everyone, not all forms of abuse, leave bruises,” she said. Now in its fourth year, the Orange Day March was first championed by the winner of the 2015/16 Nurse of the Year, Treveen Palmer-Miller.